This product contains 5 graphic organizers written completely in Spanish. 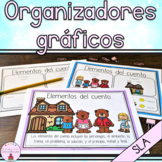 Included are KWL, story map, fact or opinion table, 5 senses table, and character map. Please download the preview for complete view of organizers. 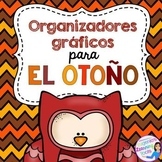 Este organizador gráfico ayuda a los estudiantes a crear una historia bien escrita con una trama que se desarrolla lentamente. This is a set of book reports that can easily be used in the classroom in reading centers. Students will be able to identify story elements such as the Title, Author, Characters, Setting ,etc. It can be used in a writing/reading station, independent work, etc. You will get all the necessary materials to create your own writing charts for opinion, narrative and informative text types. 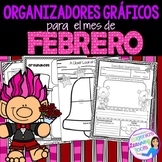 All graphic organizers and headers for charts are in both ENGLISH and SPANISH. The cover page of this product has a picture for each poster. 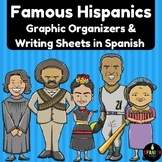 These graphic organizers are great to use with almost any Calle de la Lectura readings. You can use them to help students show and build understanding. They are completely in Spanish and are differentiated. There are blank pages and pages with sentence stems. I use this graphic organizer to have students create their own procedure. They tell what they will be making, what materials or ingredients are needed, and what steps are needed to complete it. Spanish version. I LOVE read alouds! My kiddos look forward to them daily. What better way to ensure comprehension than by using graphic organizers to reinforce skills needed to become a successful reader. All you have to do is provide the story. Get those Read-alouds together and lets get started! 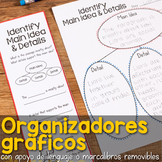 You get 11 different Spanish Graphic Organizers to help your Spanish, Bilingual, and Dual Classrooms organize thoughts and ideas, and best of all they are completely editable. You get to edit them to your needs if you like.